Been spending several weeks working, playing, and talking about Google Wave, picking up tips and tricks for usage as I’ve gone along. The Wave preview is very young, with lots of broken windows and signs that point to nowhere, but there’s still lots of neat little functionality and must-know searches, operators, and quirks. 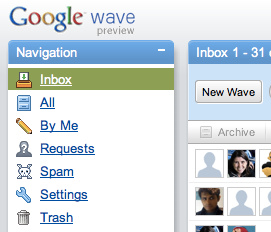 This morning over at Lifehacker I got to run those down in my Google Wave 101 feature article. There I included my best answers to the most frequently asked questions I’ve gotten about how to use Wave. I’ve also started a public wave of comments on the article where other Wave users can ask questions and add insights. If you’ve got a Wave account, after the jump you can dive in. You’ll have to sign into Wave in order to see and participate in the embedded wave below. Keep in mind that there’s a little more turbulence in Wave today than usual. Viva la preview! Sounds interesting, but I can’t sign-in to Wave because I haven’t received an invite yet. Send me an invite if you have some extras. Thanks. Even being signed into wave, I still cannot see the embedded wave. Sorry about the embedding problem, all–should work now (if you’re signed into Wave). I heard you say in a podcast about Wave that Waves need “gardeners”. And I see that it’s apparent to get into the technical details of what a Wave is and how to manage those. However, as for the gardening bit: our rational, linear mind will discard information that may be relevant from one part of the mind eco but will be lost in the process of weeding, hence disempowering the collective. Like Margaret Wheatley explains: systems that are open to all information, including that which is disruptive for the organisation, remain vital. As a result, â€œGardenersâ€ may unbeknowingly drain the life out of a Wave. I can somehow see a connection to your post about Leo Laporte and marketing to smart people. It’s not about making the process dumber, it’s about making the managers of that process smarter. Does this make sense? What is a good mindset to approach a Wave, of your own collection of waves? I have only been in someone else’s sandbox Wave, by the way – on my own, so I can’t say anything about the process of waveing with others 😉 but maybe that’s a benefit rightnow.